Your event can be as small or as large as you want. Any way you celebrate is great! 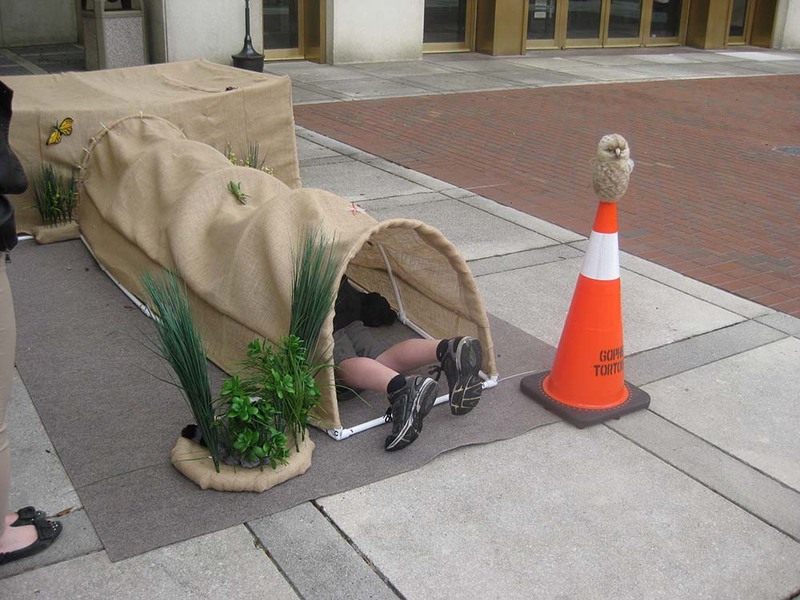 Here are some ideas that can be easily implemented in your city or neighborhood. 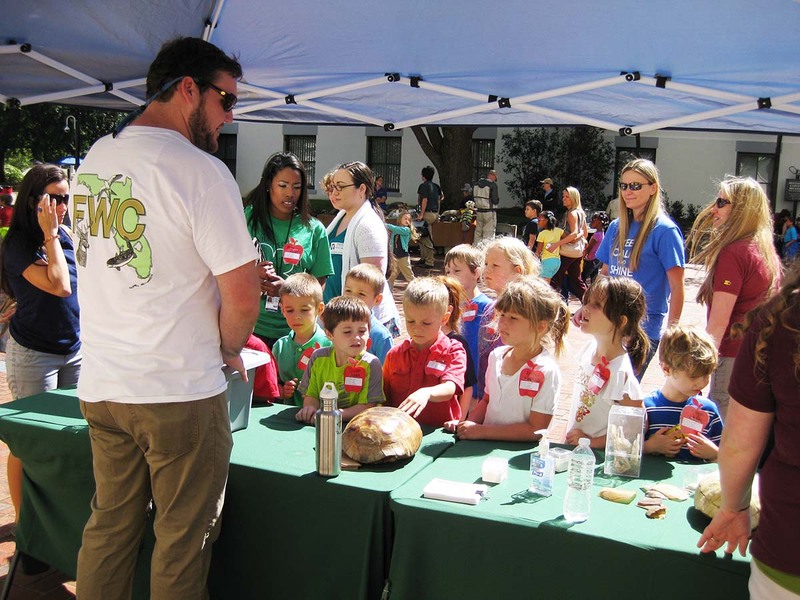 Also below are gopher tortoise-related activities you can implement at your event. We would love to hear about your events and receive some photos on how you celebrated Gopher Tortoise Day. Visit Facebook.com/MyFWC to share or send us an email. Don’t forget to use #GopherTortoiseDay on social media posts! Gopher tortoises rely on open sunny habitat for foraging, basking and digging burrows. Volunteers can help improve potential habitat for gopher tortoises at local parks by cutting tall vegetation and killing invasive exotic plant species. 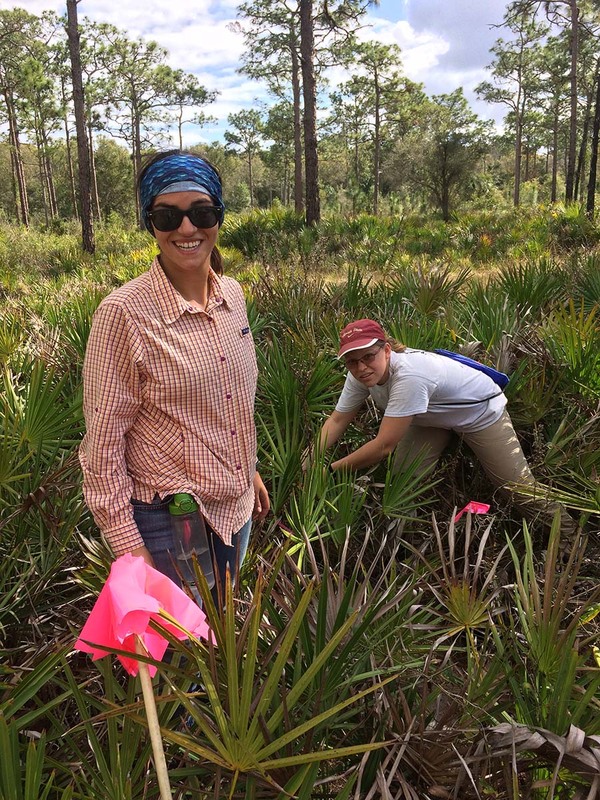 Working with park staff, you may also be able to help plant native gopher tortoise forage plants using A Florida Guide to Gopher Tortoise Friendly Plants, or conduct a burrow survey and create a map. Park staff may also provide a program with information on gopher tortoises and their habitats to the group/visitors! 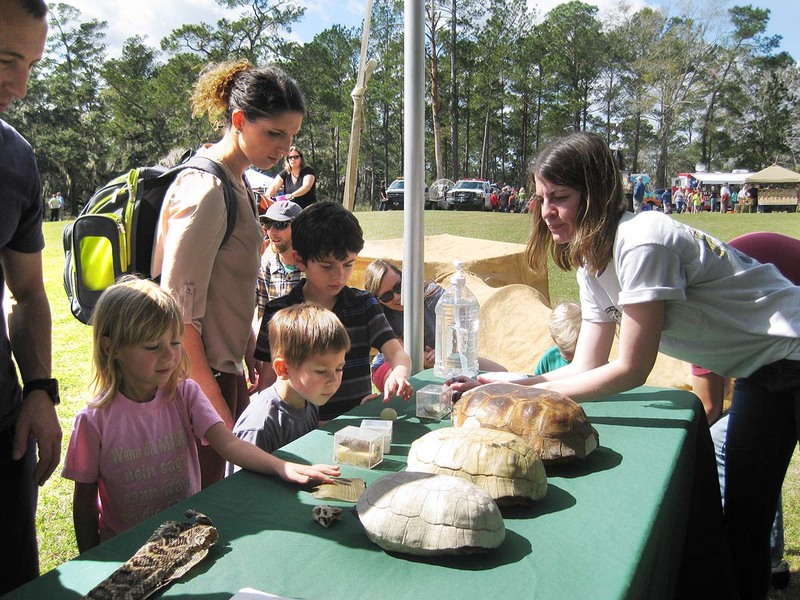 You can attend or host your own wildlife or environmental-themed festival and highlight the gopher tortoise by hosting on-site activities, setting up a booth/table and distributing brochures and information, and having a local expert give a presentation on gopher tortoises. Kids will have a blast doing these hands-on activities that can be easily implemented using the materials below. You can add any one of these activities to an event or volunteer day, or just for fun at any time! The Gopher Tortoise, by Zander Srodes. This children’s activity book, reprinted by FWC in February 2009, is an educational activity book that introduces the life history and ecological significance of the gopher tortoise to young audiences. Gopher Tracks, by Susan Jane Ryan. This 62-page book is most appropriate for fourth-graders and up. The book introduces gopher tortoise ecology, the role of fire in upland habitats, and the importance of environmental stewardship through the adventures of two girls, Tamika and Diana. 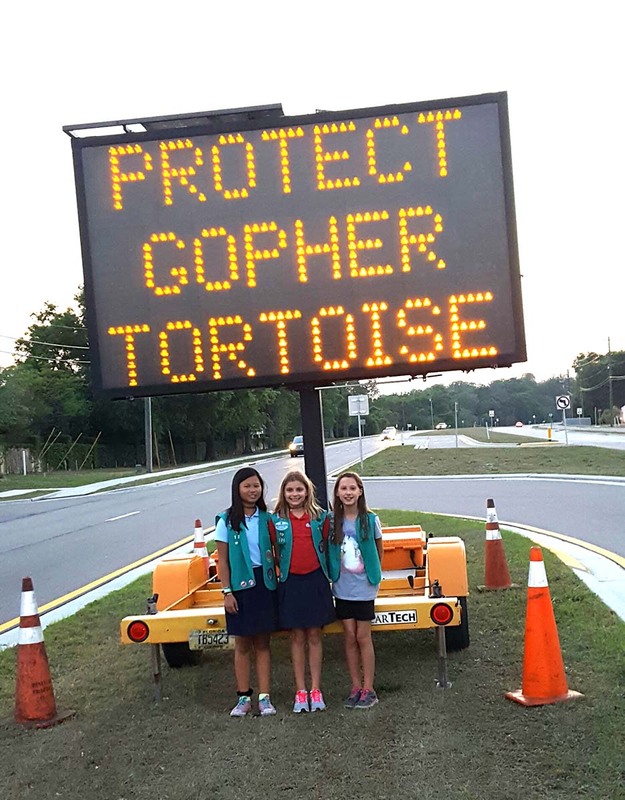 Troop 60720 of Beautiful Waters Girl Scout Service Unit promoted their Gopher Tortoise Habitat Protection Awareness Campaign on Gopher Tortoise Day in 2017. The campaign included an educational program, digital message boards on two busy roads and a mail-out campaign. They also spoke at a Pinellas County Board of County Commissioners Meeting and received a Gopher Tortoise Day Proclamation. Landscape your yard or neighborhood using gopher tortoise friendly plants. With the appropriate permissions, install road signs where gopher tortoises are known to occur or where they may frequently cross roads. Find out other ways you can be Tortoise-wise by visiting MyFWC.com/GopherTortoise. Download the “Florida Gopher Tortoise” smartphone application (app) to record the location of gopher tortoises you may see in your yard, neighborhood, or crossing the road. This information will help FWC biologists better understand where gopher tortoises live in Florida. You can also view the interactive map to see where gopher tortoises live near you! Celebrating Gopher Tortoise Day is one way to increase awareness and help tortoises in your community, but many of these activities can be done year-round to benefit this important keystone species!